This artbook features 80 pages of gorgeous original art and sketches from the production of '99 Spirits', with commentary by the developer. 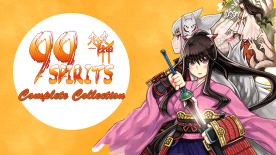 The original soundtrack of "99 Spirits", including the full version of theme song "Ken-Shi-Ai-Den", a special medley and Japanese rock tracks. Rumours of someone collecting swords and kidnapping girls have reached the young blacksmith Kotetsu and his childhood friend Waka. A cryptic new Tsukumogami lurks in the night. Meanwhile, a darkness grows within Kotetsu as he is drawn into one battle after another.